When you are making this, please keep in mind that if you or your intended gift recipient has an iPhone 5, this sleeve won’t fit. The iPhone 5 is .37″ taller than the iPhone 4/4s. Adding .75″ to the total length of the fabric piece that you cut out should compensate nicely. Please feel free to ask any questions or leave me comments in this post! Thanks! 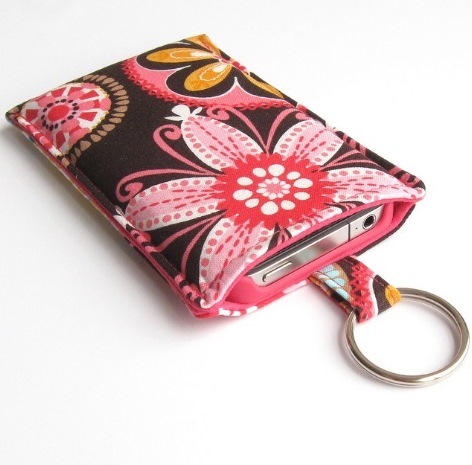 This sleeve will fit the iPhone 4/4S with a lightweight case. I’m assuming everyone with an iPhone 4/4S has a case on it. If you have a thicker case, then you might want to make this a bit wider – 1/4″ is enough to make a difference. If you are a rebel and don’t have a case on your iPhone, then you can increase your seam allowance when you stitch up the sides. This sleeve is supposed to fit very snugly so the phone does not fall out. Use the tab to help you slide the phone in. If you want to make it larger so it does not fit so tightly, you could add some sort of tab closure to the top to keep it from falling out.